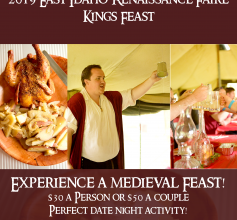 East Idaho Renaissance Faire: Kings Feast at The Renaissance Faire on June 28 & 29 and July 5 & 6! Join the King, Queen, and their knights for a special event and celebrate in medieval fashion with a three-course feast sponsored by his Majesty, Henry Rupert III. Choose between smoked tri-tip beef or amazing Cornish game hen (chicken). You will be serenaded by minstrels and entertained by jesters & jugglers. Then get to experience an amazing fire show at dusk. This is a perfect date night activity for couples or for someone looking for an adventure. Experience a medieval feast on your own terms! Visit www.renaissancefaireidaho.com/kings-feast for more information and to buy your tickets. For customer service contact info@renaissancefaireidaho.com or (208) 534-6109. Evans Hairstyling College: Open House on Thursday, May 2nd from 6:30-8:00pm!